What an honor to have been nominated for a member spotlight. In my early teens I was informed that I would never have children but was blessed with one child. Definitely my little miracle! And the reason for my ID. My daughter's name is Catheryn. Most who see my ID assume I keep cats. Just not the 4-legged kind. Animals have always been a part of my life. Growing up in the city we had dogs, chickens, hamsters, etc. At one time we even kept a live pheasant, but he attacked me one day and became dinner that night. My first experience with keeping fish started in grade school when I won 3 goldfish at the school fair. I came home proudly carrying those goldfish. My parents were none to thrilled. But, they went out and purchased a bowl and some food. Filled it with water and dropped in the goldfish. Somehow those fish managed to live for a short time. We'd put away the fish bowl until the next school fair. I managed to always win new goldfish. And would always be disappointed when they'd die. Our LFS was no help either. Met my husband while in college studying music. Unfortunately he refused to allow any pets. I was so lonesome for pets, but my daughter kept me more than busy. The first thing I did after my husband and I split was to purchase an aquarium. My 90G tank. I had always heard that you should purchase the largest tank you could afford. And I did! When I bought my new tank, I had intended to keep saltwater fish. But being again single, I could not afford all the equipment (overspent on the tank). I ran out of money after adding lights and a filter. Still not knowing a thing about cycling, I set up my tank, filled it with dechlorinated water and turned on the filter. Tank ran like this for close to 6 months. I'd just top it off periodically. Didn't bother to remove the flies and moths that would die in the uncovered tank. Didn't know it then, but I cycled my tank on dead insects. 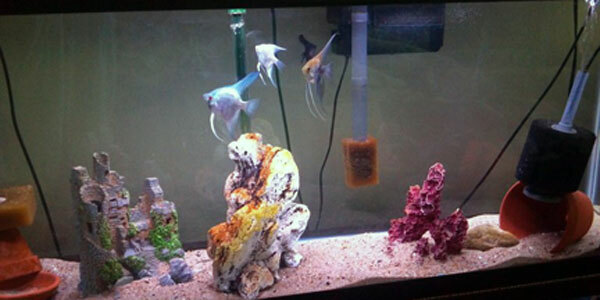 Once I could afford fish, I filled the tank with angelfish, neons and gourami. Didn't know that I had to acclimate fish, but many somehow managed to survive. When one would die, I'd go to the fish store and pick up a replacement and empty the contents into my tank. I have no idea how anything survived these early days; and the LFS was more than happy to sell more fish. I have learned a ton about keeping fish since then. Those earlier days amaze me at how little was known about fishkeeping in general. I ended up tearing down my tank for a couple of years due to health issues. By the time I started it up again, the Internet opened my eyes to how to be a better aquarist. *Understand the Nitrogen Cycle. Tank stability is not optional! *Use the fewest chemicals possible. Nature has evolved into a wonderful eco-system. Let it be your guide. *Python hose. Best purchase ever!! But it breeds MTS! *Research everything. Ask questions and research more. Then, purchase. Interested in a Planted Tank? 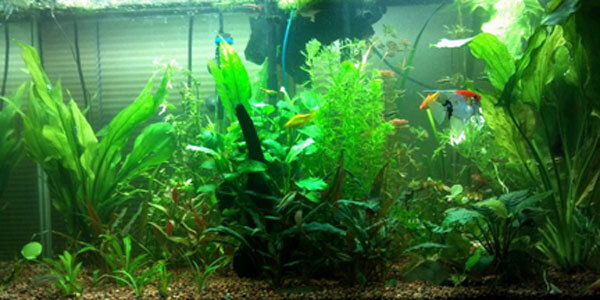 *It is lighting that determines which aquarium plants can be grown in your tank. You wouldn't expect full sun garden plants to grow well in total shade outdoors any more than you'd expect high light plants to grow in a low light aquarium. *You do not need a special substrate. Plants will grow in basic gravel, pool filter sand or the high priced planting substrates. *Don't forget to do your research! Many plants sold in the aquarium trade will not grow fully submersed. *Give all new plants a 1:19 parts bleach water. This dip will remove eggs, hitchhikers and pathogens. My pride and joy is still my 90G. This tank was converted to a high tech planted tank a couple of years ago. It runs 216W T5HO lights on timers with injected CO2. Filters include two 350 Magnums, one with bio-wheels; and a UV Sterilizer/power head. I dose dry ferts daily and root tabs quarterly. Plants include Amazon Sword mother plant, Ozelot Sword, Aponogeton ulvaceus, Purple Cabomba, Myrio Green, Bacopa, Pogostemon stellatus, Giant Vals, Corkscrew Vals, Anubias nana, Anubias coffeefolia, Crypt Lutea, Crypt Undulata, Crypt cilada, Red and Bronze Crypts, Dwarf Sag, Ludwigia Broad Leaf, Alternanthera reineckii. Fish stock includes Angelfish that I've raised from fry, Black Neon, Cherry Barb, Gold Barb, Bristlenose pleco, Albino cory, Peppered cory, Bolivian ram and a heard of Kribensis pulcher fry (rabbits don't hold a candle to these guys). With the injected CO2 and live plants, the parameters run 6.2 pH, 10PPM NO3, 3 dKH, 8 dGH, 10+ PPM PO3 (courtesy of my tap water), 1.0 PPM Iron and temp runs 80F. 125G is my most recent set up, started July 2011. Purchased the tank off Craigslist, but it started leaking. Did some research and resealed it! Started again last summer just after my cancer surgery. It reminds me daily of what I've been through!! This tank has basic fluorescent lighting and is filtered with a Rena XP3 and an AC500 HOB. This fish only tank is housing mostly rescues: schools of Silver Dollars, Clown Loaches and Australian Rainbowfish. Plus there is a Common Pleco and a few of my unpaired angels. This tank practically takes care of itself! I have yet found a need to clean algae off the glass!! Parameters run 7.2 pH, 5PPM NO3, temp 78F. Don't run any other tests on this tank. Tank also holds about 40 pounds of driftwood. 55G is currently housing 4 angels that I hope to have pair and more than a dozen nickel to quarter sized Blue Smokey and Pinoy Smokey angels. I received the acrylic tank as a rescue. It was less than half full of water, no heat, no filtration and housed a 18" pleco, 24" pleco, two 6" Clown Loaches and two 8" Silver Dollars with severe fin rot. Water stank from the waste! That was 2 years ago. Today, it has fluorescent lighting and filtered with an AC50, 130G sponge filter and a 25G sponge filter used for a quick hospital tank cycle. Heated to 80F and parameters run 7.2 pH, 10PPM NO3. 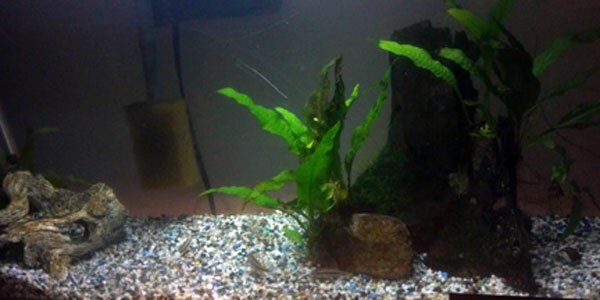 In January 2012 purchased a glass tank to replace the overly scratched acrylic tank. I cannot believe how crystal clear this tank now is! Decor is ugly junk I had in the house. This is not a permanent tank, but instead is a QT/growout tank with a thin layer of sand. 25G another rescue tank that is used as a QT/growout tank. Standard fluorescent lighting and filtered with an AC30 and sponge filters. Tank has Java Fern and Java Moss covered driftwood. 12G Eclipse rescued from abandonment. Owners shut it down with live fish hoping they'd die. When they weren't all dead in a month, they dropped the tank on my doorstep. After 15 years, the only survivor is a foot long common pleco who now resides in my 125G. Today it is used as a hospital/QT tank. Currently housing pea sized angelfish fry and many snails. 5G Eclipse Hex houses a male CT betta and a piece of my Anubias coffeefolia. As this tank hood only holds an incandescent light, I am using a CFL bulb and tank is next to a window with lots of natural lighting. Heated to 77F. I hope to be able to grow a few plants in this tank. The black sand is nice, but too boring for my taste. 2.5G was recently converted to a RCS shrimp tank with naja grass and a sand substrate. Been reading about using a 1G pickle jar inside an aquarium with sponges. Basically it becomes an oversized sponge filter with fry trapped inside. Looking for the right sized sponges and will be giving it a try. The daily water changes get very old! Also have many 10G and 20G tanks in storage, along with that overly scratched 55G acrylic tank I just replaced. All tanks get weekly water changes of 30 - 75 percent. Fish are fed a wide variety of foods. Flakes and pellets as a staple and supplemented with fresh vegys and frozen foods; are fasted at least one day a week. A few times a year I also offer feeder fry or ghost shrimp as live foods, especially helpful with breeding pairs of angels. I'd like to thank my daughter for her patience with my growing addiction! Every time I start rearranging furniture she tells me that we already live in a fish bowl and do not need another tank. Silly girl. Our house is still made of wood, not glass. And, many thanks to everyone on Fishlore! I found this site when trying to figure out how to get rid of the algae taking over my newly planted tank. I have learned much from newbies and seasoned members. Far too many to thank everyone. But a special thank you to Nutter and NateMcFin for the crash course in growing plants, not algae, in a high tech tank.